As humans interact with the biosphere—which encompasses all the ecosystems of our planet—researchers at the National Ecological Observatory Network (NEON) are listening and taking notes, solving ecological challenges faced regionally, nationally, and globally. NEON, funded by the National Science Foundation, is the first continental-scale observatory established to examine critical ecological issues and provide the public open access to the scientific data products resulting from this research. The Jornada Experimental Range in Las Cruces, New Mexico, is one of three NEON sites chosen to represent the Southwest Deserts of western Texas, New Mexico, Arizona, southern Nevada and southern California. The Jornada has emerged as a leader in the arena of broad-scale ecological research, which made it a prime location for the NEON site. The Jornada is unique in that it is the only NEON site tied to three additional national networks: the Long-Term Ecological Research (LTER) program, the Long-Term Agricultural Research (LTAR) program, and the USDA’s Climate Hub network. Each network addresses different but related objectives, and the confluence of the four programs at The Jornada delivers exceptional perspective on the global-scale ecological issues surrounding arid lands. The historic Jornada Experimental Range, with over 100 years of collected data, is well positioned to answer the big scientific questions about climate change and ecological dynamics. The NEON research activity at The Jornada site will generate valuable data that has never before been available to the public, providing quality information that can be used to solve mysteries about how things work in arid land ecosystems and contributing information on a national scale. With its reach spread across 60 strategically selected sites, NEON is designed to capture a comprehensive range of data over the next three decades, from global satellite images to individual organisms at ground sites. As the data reflects important ecological processes, NEON will be able to present this information as an effective tool for educating the public about how global processes affect things happening in our own backyard, and how our individual actions, in turn, affect the biosphere. NEON scientists are working toward gathering data to measure the causes and effects of climate change, land use change, and invasive species on natural resources and biodiversity. One of the ways NEON ensures data collection methods remain consistent across all 60 sites is by partnering with the USA National Phenology Network. The network helped determine protocols for collecting specific data on when plants go through key phases of development, such as first leaf development or seed maturity—observations that are thought to be sensitive indicators of environmental change over time. The established protocols allow for comparable information across sites, whether the NEON station is in a desert, marsh, field, tundra, or even at an underwater aquatic site. After this collected data is processed, the network will generate data products to share with the public. For the first time, a diverse group of people—from the scientific community and lawmakers to students and land owners—can easily access volumes of information and educational resources from a consistent scientific research infrastructure. 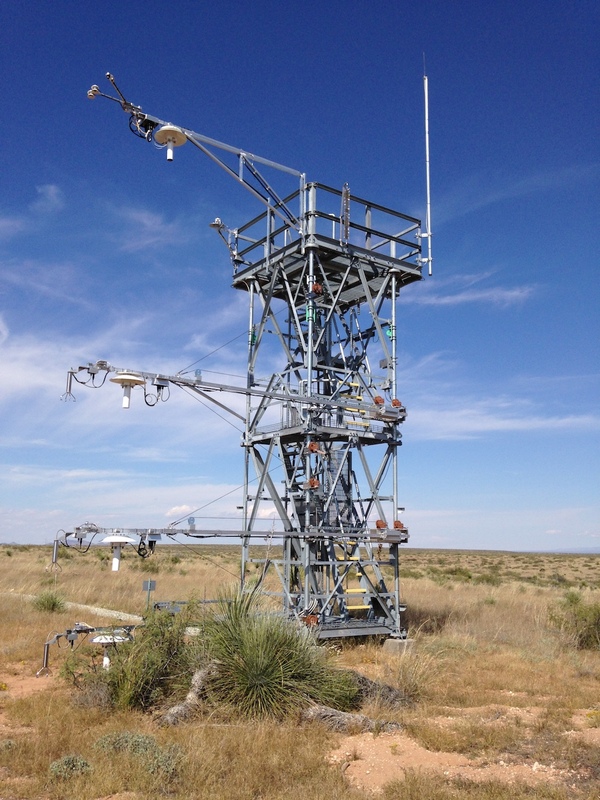 Another exciting facet of The Jornada NEON site is that constant, automated measurements will be taken by using electronic sensors mounted on a 27-foot high tower constructed at the Range in 2013. The tower’s instruments will monitor hundreds of different physical and chemical climate properties, ranging from air pollutants and soil features to CO2 and incoming radiation. NEON staff, working with the Jornada, are now in the process of deploying the instruments and planning field studies for data collection. Both NEON and collaborating scientists will measure vegetation change using innovative mapping methods. From the NEON Airborne Observation Platform, a plane fitted with a spectrometer allows scientists to create images that precisely identify individual species of vegetation, both native and invasive, at each site. By studying the resulting vegetation maps of a region, scientists can construct a picture of how these ecological systems are performing. Another component of the Airborne Observation Platform is a remote sensing method using light detection, called LiDAR. This laser-based technology can scan the ground to create a three-dimensional view of vegetation and typography surrounding the sites. This view allows scientists to study changes in the surface of the Earth, identifying key structural markers of ecosystem change. Combined, these two instruments provide images that revolutionize the way we view changes in ecosystems today. Complimenting NEON’s Airborne Observation Platform is the Jornada Experimental Range’s Unmanned Aerial Vehicle (UAV) program, which will work in tandem with the piloted airborne observation effort to provide data collection. This added layer of depth is found only at The Jornada, where the active UAV program is already integrated into several research areas. Because data from NEON will be collected in a systematic, consistent way, scientists working at NEON sites can respond to looming questions about impacts of any future ecosystem changes. For example, NEON data will eventually provide information on carbon dynamics across the country, revealing a national-scale model of how CO2 emissions affect the planet. Combined, these sites will provide the necessary big picture of how the Earth is reacting to the plethora of natural and human-caused factors ultimately contributing to changes in our biosphere.